Summer can be both a blessing and a curse. We all love a bit of sunshine, but tend to forget the downsides of the double digit temperatures quite easily. In all honesty it took me some years to come to terms with the summer days. When I was younger, I couldn’t cope with the heath. I still struggle when the temperatures are tropical, but I always try to stay as calm as possible. Also, the sun feels like it is literally burning my skin. A bit of sunshine is nice yes, but you won’t see me lying on the beach (without a parasol) anytime soon. Anyone with me on this? A sunny day loses its charm the moment I start sweating uncontrollably, and feel the need to jump into a pool/the ocean, only to realise that I still have the entire day ahead of me… Oh winter, how I miss you! Humans aren’t the only ones that love a bit of sunshine. The amount of bugs flying/crawling around absolutely terrifies me. If you see a girl sitting on a park bench, frantically batting her arms trying to hit bugs, it will most likely be me. Anyone that does not seem to suffer with me instantly earns my anger mixed with disgusting jealousy. How I long to be like you, happy, carefree and enjoying the weather. Instead here I am, all sticky and flushed, wishing for winter to come. If you are living on this side of the world, the part with the most unreliable summer weather, then my friend, you will ask yourself this question daily. Yes, it is sunny now but in 30 minutes it will start raining, the temperature will abruptly drop and, oh great, a storm is coming! Do you know how to dress for these possibilities? I certainly don’t. All I know is that you always end up being either too hot or too cold. The joy. All jokes aside, I am genuinely looking forward to this summer. Every year my summer is better than the last, as I try to improve my mood as much as possible. What does it really matter if I am a little sweatier than everyone else, or if I happened to miss that one spot on my knee when shaving last night… What matters is that I am enjoying these rare days in life, where the world just seems to be a little brighter, a little happier and a little friendlier. 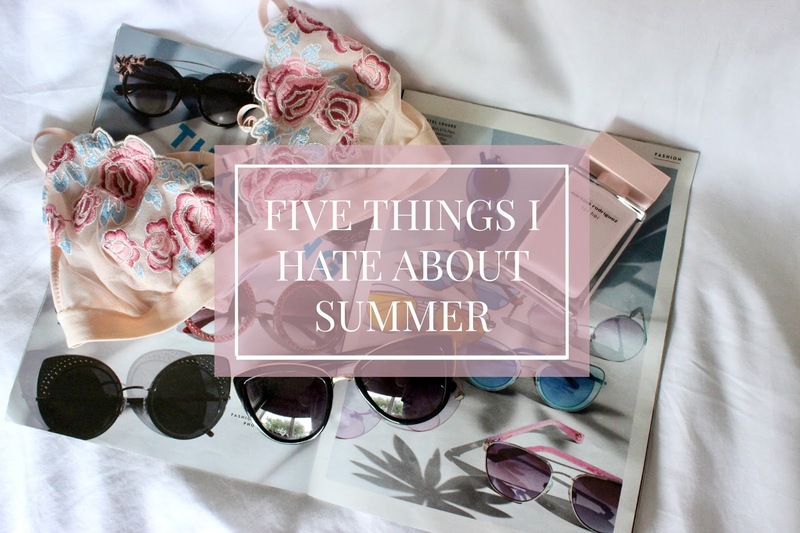 I would love to hear your dislikes about summer in the comments below! Ahahahah! Come on! It's an amazing opportunity to have a good ice cream and chill out at the park (or in the pub's gardens) hehe!